Birdy Cartwright is a graphic designer for a small printing press. Birdy is fun, easy going, artistic, kind and recently engaged. When the book starts we are introduced to Birdy’s engagement as she is being chastised by her childhood best friend, Saul. You see everyone hates Brooke, Birdy’s new fiance. Brooke Winters is uber-successful, super attractive and is used to getting her way. Birdy is another piece of the pie she’s determined to get. After waiting years for Birdy to pop the question, Brooke grabs the bull by the horns and takes charge, even though she knows that Birdie has always wanted to do the honors. Once her plan for a fall wedding has been set, let the steamrolling begin. Sydney Ramos is a newbie to Portland by way of Austin. Planning to just stop in a visit an old college softball teammate as she headed to Seattle she fell in love with the city and its ambiance. Deciding to stay, she gets a job as a screen printer at Birdy’s shop. Hello, new employee! What she didn’t expect to happen was to meet the girl of her dreams, too bad she’s engaged. So this love triangle is a hot mess. Birdie’s set to marry Brooke, but she doesn’t expect to have those little tingly feelings for her new smoking hot co-worker. So like a moth to a flame she finds a multitude of ways to hang out with Sydney. Does she feel guilty, well yeah, but Birdy and Sydney just can’t help the flirting and longing glances. Sydney is determined to fight for Birdy’s heart, figuring she is pretty much fair game till the white dress and the long aisle. Oh, the tangled wed of emotions. If you have read Rainbow Cedar by Gerri Hill, you know a love triangle can work to set up an interesting premise, where the couple that walks aways isn’t hated by the reader. This is kind like that but with one major problem. Brooke is set up to be kind of a jerk but you don’t know is she is truly a b**ch with a capital B till the end. Birdie while totally into Sydney, she isn’t 100% over Brooke, yes she’s going through the motions of the wedding but she still loves her. That’s where it gets difficult. Sydney is playing a dangerous game, and you feel for her cause she can’t help herself, you kinda want to slap Birdie in the back of the head and maybe kick her in the shin for dragging Syd along. You also want Syd to get a clue and stop letting her heart get stepped on. Birdie keeps saying no she can’t leave Brooke and what they have but then goes right back to the come-hither looks to Miss Ramos. The vast majority of the book is Birdie being an engaged woman, and she wasn’t trying to get out of it, she was just trying to get over Sydney. When all three characters are at the engagement party and Syd has to watch both Birdie and Brooke make declarations of love to one another, I was pretty much just hoping for Sydney to just bust out her Nike’s run. Save yourself, girl, this is not worth it. Then around the 90% mark, Brooke makes a massive mistake, the straw that broke the camel’s back if you will, and that part while I was glad to see it finally come, I just couldn’t buy that someone so calculating as Brooke was, would ever be so forthcoming. Technically I thought this was a well-written book. I liked Birdie and Sydney, I just wished the author would have villanized Brooke much earlier and given Birdie a backbone. There needed to be more heart-wrenching emotion from Birdie to really sell her dilemma. You almost got to the point where you wished her demise for being a jellyfish. 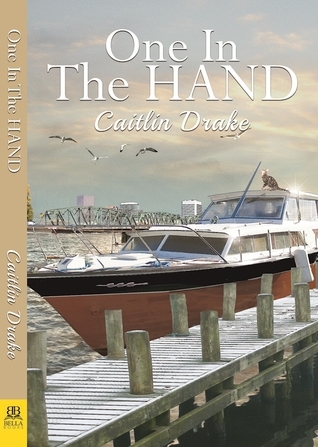 For this being Caitlin Drake’s first book, I thought she did a dang good job, and I would absolutely read her next one.